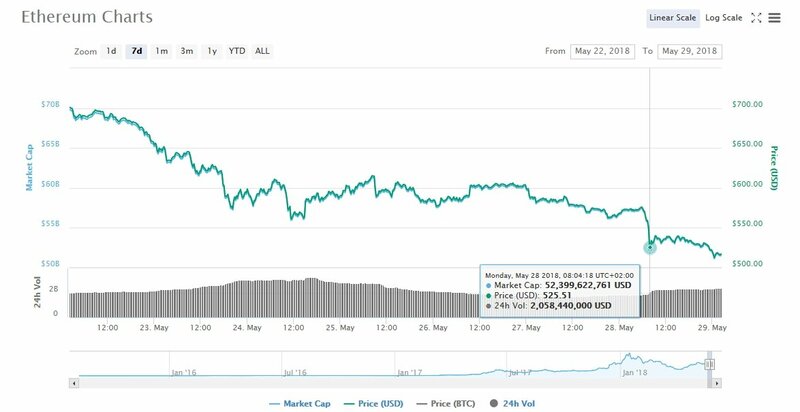 Ethereum token price against the US Dollar takes another major hit. Reportedly, approx. six o’clock the pair ETH/USD was tanked heavily downwards on the unregulated exchange Bitfinex. During the hour of the great deep-dive, somewhat 180k ETH exchanged hands as it went up from only 20k. That’s compared to somewhat usual trading volumes of around 20,000 eth on OKex and Gdax, suggesting clearly someone sold a lot of eth on Bitfinex. With the bears continuing to push downward, another tanking-whale pops out and with that the market goes to violent selling-mode. There may well be insider information, but in that case you would have expected a more general sell-off across exchanges. In the development, the trader/traders bordered themselves within Bitfinex. From that it has reported by TrustNodes, that one individual or team limited to Bitfinex only, made the great sell. And the blame goes to EOS. According to a previous post, EOS only in a month spent just below $850 mln in ETH. However, as highlighted out, around 4 days ago EOS spent $1 million which is lower than today’s $1.4 mln.